Aikido is a peaceful martial art developed in Japan 70 years ago. A warm, spiritual mood permeates the practitioners. Aikido is for everyone. It does not depend on physical strength, weight or height. You rely on your ability to blend with your partner's incoming energy to redirect it. It builds self confidence and teaches harmony of movement and defensive strategies that can be used when needed. Aikido embodies high ethical principles and offers a peaceful way to resolve conflicts. There are no competitions in Aikido, since the art is not based on winning or losing. Instead it is a martial art based on neutralizing an attacker and controlling the situation without bringing harm to either individual. 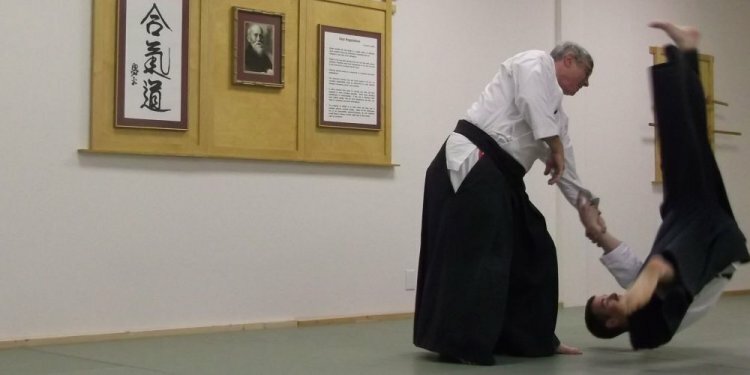 Aikido emphasizes the development of Ki, or spiritual energy, along with harmonious movement rather than physical strength when engaging an opponent. Taijutsu - unarmed neutralization of physical attack. Kenjutsu - traditional Japanese sword arts. Bojutsu - traditional Japanese staff arts.